Tongue-tie is a condition involving a small piece of tissue that connects a baby's tongue to the bottom of their mouth. 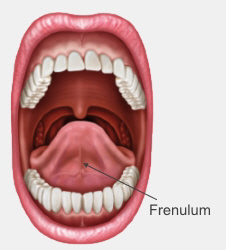 This is called the lingual (meaning tongue) frenulum, often just called the frenulum. Everyone has a frenulum, and everyone's frenulum is a different length and thickness. Sometimes a person's frenulum isn't visible. When a baby's frenulum is short or tight it can stop their tongue from moving properly. This is called a tongue-tie (also called ankyloglossia). Around 5 to 10% of babies are born with a tongue-tie, but at least half of these babies can still breastfeed normally. That means around 2 to 5% of babies have a tongue-tie that may cause a problem with bottle or breastfeeding. Written by Canterbury lactation consultants and neonatologist. Adapted by HealthInfo clinical advisers. Page created January 2017.